So I logged into Facebook and it was there! This is sad! I really hope more don't leak, this won't be good for Jesse or for his album. well he did already perform the song and people are desperate to hear his songs because of how long they have waited but it doesn't change the fact it can hurt the album and Jesse has worked soooo hard. If anyone else sees this, please be patient and ignore the link. I'm not on facebook but anyone who is on there, maybe you can report the link? I know it's kind of hard considering i'm sure other people will just reupload it or post it other places. Our only choices is to either let it go or report it. It's hard to catch them all but I guess catch what we can.... I haven't even heard the perfoamce version or any other song accept Shake, one night and Mrs. Mistake and I wish I could have waited to even hear that much but i'm vowing to hear no more! I know what you mean. I'll try and do something, I want the video to be taken down. I did listen to it and it sounds more like a demo. I really bad for listening to it But I'm a good fan and I'll be buying the album for sure!! You can tell Jesse has worked really hard. jessefan wrote: I know what you mean. I'll try and do something, I want the video to be taken down. I did listen to it and it sounds more like a demo. I really bad for listening to it But I'm a good fan and I'll be buying the album for sure!! You can tell Jesse has worked really hard. oh come on girls, let's not exaggerate...as long as we're buying his album anyway what's the big deal? many artists have their songs leaked before the album appears and their sales go just fine. and after all these years of waiting i think we deserve to listen a new song in a better quality. you don't have to feel sorry for listening. i understand that leaking is not the right thing to do but you gotta take the facts as they really are: most fans are buying the albums anyway! another thought that cross to my mind...it's possible that this song got leaked because it won't be on the album anymore and they wanted us to have it anyway. as you all know jesse said this album will have songs with some deep lyrics and lyrics about parties and stuff (which is exactly what kind of song club hop is). I agree 100% with everything you said. And not to mention, some times it the artists themselves that 'leak' the song, because like you said, the song isn't going to be on the album anymore but they already mentioned it would be or performed it live, so they want the fans to be able to hear it anyway. There's no reason to feel bad and talk down yourself because you listened to it. And while, yes, physical albums sales are down, downloaded sales continue to rise. This is the digital age, after all. And true fans will always support their favorite artists, no matter the format. I hear that you guys are saying, it's just that by listening to it I won't be able to enjoy the song much when i buy the album. But yes I guess I shouldn't feel bad. I hope the leak doesn't mean it won't be on the album because I really like it!! When it does come out Ill be buying the actual CD as it won't be out for download in the UK. I don't get it... why should we feel bad about listening to the songs before album release? :-/ I knew EVERY song on departure, a friend even gave me a CD with every song on it but I still bought departure recharged TWICE and the normal departure, once. In 2009 I bought even Beautiful Soul and Right where you want me, ALTHOUGH I knew every song! I only bought these albums to support Jesse :-) I'm still going to buy Have it all! A lot of fans keep saying that he should go back to blonde and beautiful soul... But I don't think so. I thought that departure was WAY better than BS and RWYWM and I still think that way. But I doubt that have it all will be better. It kinda appears to me like every other song on the radio. Techno/Auto tune songs. Guys that are trying to show how awesome they are with singing lyrics about money and fame. Whatever. I've expected more to be honest with you guys... I never liked the lyrics of Club Hop, but when he sang it live it seemed to be a cool song. But now that I have heard the studio version I have a whole other opinion to it. Sounds too mainstream, don't you think? thank you and i agree with you too...i was actually thinking that simple thing was leaked by his team to see fans reaction regarding to him going back to his old style and his "deep" lyrics. well, i can't be sure of that but it's quite possible. and as you said, these days downloading sales is just as important as the usual one. he still gets the money, the fame and everything he needs and fans are happy as well. NikajMac wrote: I don't get it... why should we feel bad about listening to the songs before album release? :-/ I knew EVERY song on departure, a friend even gave me a CD with every song on it but I still bought departure recharged TWICE and the normal departure, once. In 2009 I bought even Beautiful Soul and Right where you want me, ALTHOUGH I knew every song! I only bought these albums to support Jesse :-) I'm still going to buy Have it all! I agree! I think that too with a lot of the leaked songs... but there's never a way to truly know for sure. I agree with both of you on all counts. It's going to be real hard to top Departure and it really is my favorite album from him so far. And while I LOVE the songs I've heard from Have It All, I just don't see it being at that same standard. This version, while yes seems like a studio version, does sound to be unfinished, not polished. Which can also mean that it'll be different on the album, especially since he went back into the studio at the end of last year/beginning of this year, to add more to Have It All. And I agree on the lyrics, while yes I'm older and have grown with Jesse, like we all have, I just can't really get into the lyrics. It's not really what we're used to with Jesse lyric wise. But the same can be said for Shake as well. I will admit that it has a great beat that is catchy and makes it easy to sing along to, even if you don't like it and don't want to. I agree with you guys. I guess it's not much of a big deal because like you guys said us fans will buy the album anyways. saying that I need have all the songs off Departure: Recharged before it was released. I had to wait a while before I bought the album because I couldn't get here in the UK. But I did buy it. I like the live version better of '"Club Hop". Hopefully the actual album is released with the song I might like it more. 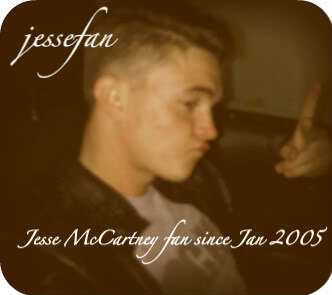 I understand why some fans want the 'old Jesse' back, I thought about it too. But I really like the new stuff he is coming out with, it has helped me to listen to other kind music because of Jesse. But I do like Departure the most. I has to be his best album to date. Saying that I might change my mind when 'Have It All' is released. I've grown with Jesse and his music and being one year younger then him, I've accepted the music/lyric changed. And I understand. jessefan wrote: I agree with you guys. I guess it's not much of a big deal because like you guys said us fans will buy the album anyways. saying that I need have all the songs off Departure: Recharged before it was released. I had to wait a while before I bought the album because I couldn't get here in the UK. But I did buy it. :-) I may be not just a year younger than Jesse, but I can't think of a day that I haven't thought about him, or not listened to his music! It's just... impossible! I've been a fan, since Beautiful Soul, 2004(!!). Almost 8 years, and I'm 16 :-D half of my life. I must say, back then I LOVED beautiful soul, I loved his hair, I loved everything about him. It was more like: he's so cute. But I don't think this way anymore. I understand the lyrics now that I speak better English than 8 years ago (I live in Germany ) I listen more carefully to the lyrics now. I love songs with deep emotional lyrics. I loved It's over, Not your enemy and Told you so. And I loved Runnin' because it wasn't only about love, you could interpret it in so many ways. Like some one just running away from their problems, not facing the truth, always trying to dodge everything. THIS is what I loved so much about his songs. When I heard Shake the first time I was so damn excited, I thought that this was the best song EVER. The lyrics weren't the best, but they were catchy, and "ear candy" as he said. But when I saw the music video, I was just like: WHAT THE HECK? I loved the beginning, when he just said: hey, heeey :-D and then... these slutty dressed girls appeared and I was like: no way! Shake is by far his worst video! Let's imagine "Club Hop" becomes the second single. What kind of music video could he do? Club, slutty dancers, alcohol, a lot of smoke... well... I hope not. What I'm trying to say with all of this, it's ok, that he's trying to do something different, but he shouldn't ruin it. He's got a beautiful voice, and he's writing amazing lyrics. He should just know that he doesn't have to prove anything with these kinds of songs. All about Money and Fame ( Even "I think she likes me" -.-). He's just not the way he used to be. I feel like he has changed. Not a Beautiful Soul to Departure change, it's more a Departure to Mainstream (Autotune, Technosounds) change.